When it comes to adding ruffles to your knits, the possibilities are absolutely endless. The methods described here are simple techniques that anyone can learn. You can tweak just a few stitches, add a single stripe, or work in a new yarn and you have a totally new look. This tutorial will show you a few easy methods, each resulting with a slightly different look. You can make single ruffles, or get a little daring and add layers of them. Use them as an embellishment, or incorporate them into a simple scarflette to create a look that’s uniquely yours. 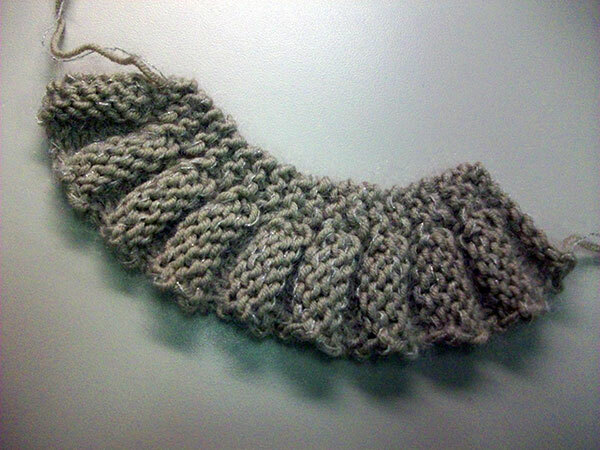 This ruffle is worked in stockinette stitch, requiring simple K2tog and P2tog decreases over two rows of your work. You would cast on 4 times the number of stitches required. In the example below, we’ve chosen to cast on 80 sts, so we can arrive at 20 stitches, which would make a pretty edging for a scarf. Cast on 80 sts; then work in St st to your desired length. Next row: (RS) K2tog across. To make a double ruffle, you would work the basic ruffle above, and then work two additional rows in St st.
Leave the work on needle and place aside. With a new needle, work a new basic ruffle; then work in St st for 8 more rows. With right sides facing, place the needle holding the shorter ruffle on top of the needle holding the longer ruffle as shown in the photo below. 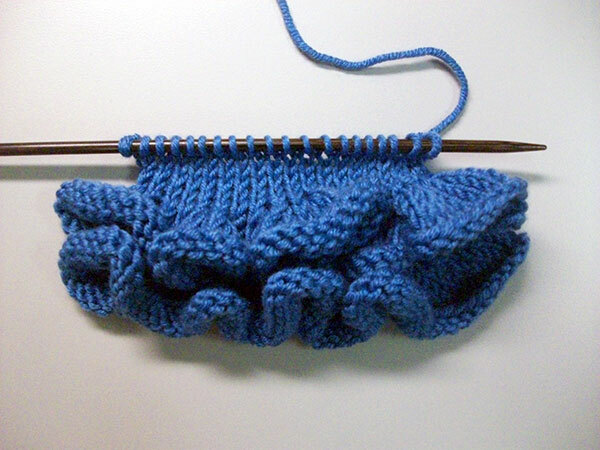 Knit the first stitch of each needle together. Working two ruffles together with a third needle. And with a little imagination, you can add some rows of color and work in K2, P2 ribbing, and add another layer of ruffles as in the example below. 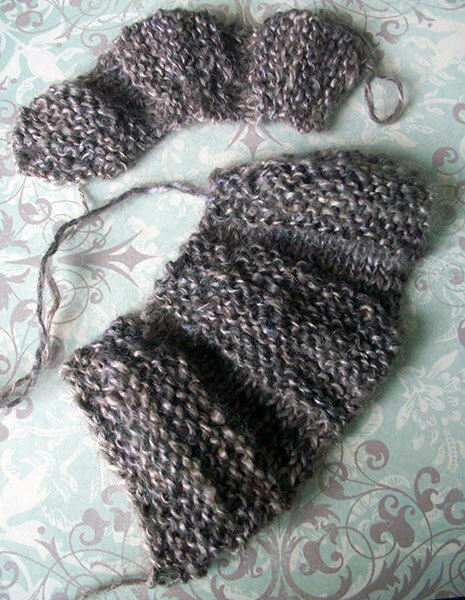 Another variation: work the first few rows of your ruffle in garter stitch; knit every row and then finish off in stockinette stitch. 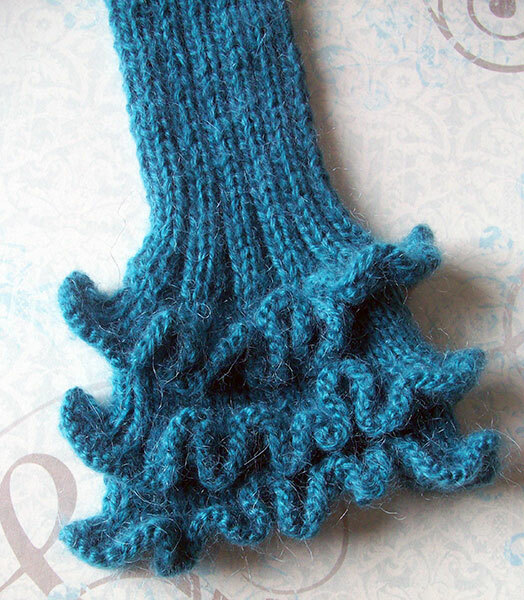 If you decide to make your ruffle into a scarf, just keep on knitting every row in garter stitch to echo the edging. Very similar to the Single Basic Ruffle but with a slightly different look, the Basic Frill is achieved by working the decreases in a slightly different manner. Below are instructions for working a single frill and an example of working a double frill to add layers of luxurious ruffles. Cast on 4 times the finished number of sts required. Row 1: (RS) * K2, lift 2nd st over first st and off right-hand needle, rep from * to end. Row 2: *P2tog, rep from * to end. Cast on 4 times the finished number of sts required. Three knitting needles are required. 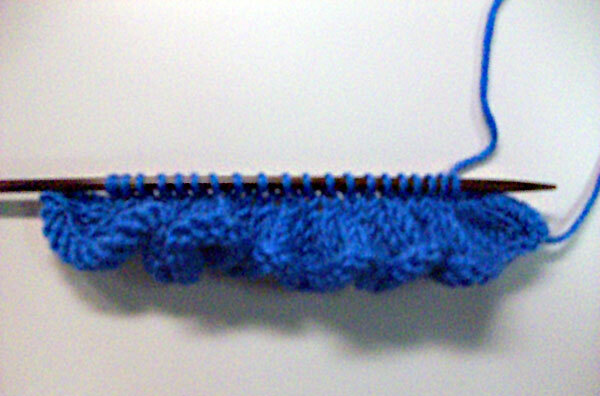 Work the single frill, followed by two rows of St st. Leave the work on needle, and place aside. With a new needle, work a new frill. Then, work in St st for 8 more rows. With right sides facing, place the needle holding the shorter frill on top of the needle holding the longer frill. 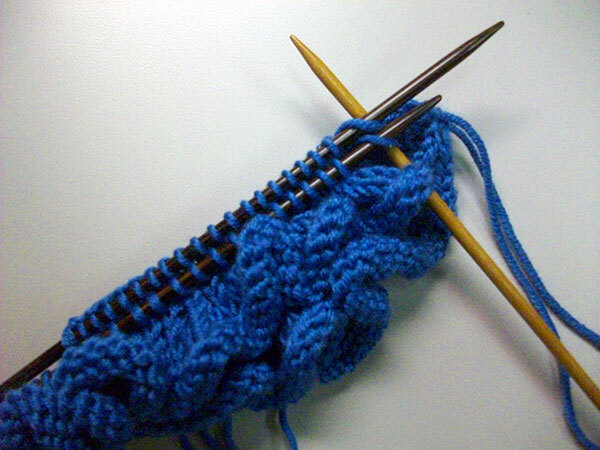 Knit the first stitch of each needle together. Repeat across row. 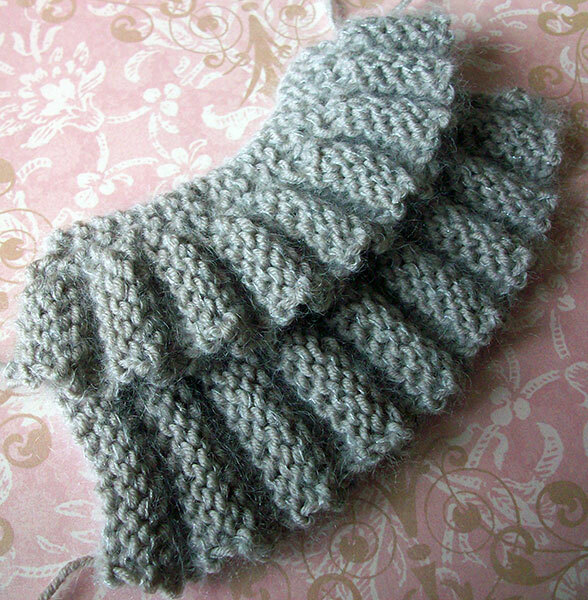 The example below is one of my new scarflette designs in the works, made using the frill method. My chosen yarn was Universal Swiss Mohair in color sky. Click here to order this yarn. I decided to knit this piece with two strands held together to give more body to this little scaflette. Scarflette with three layers of frills. Don’t let the words “short row” scare you! I promise: no picking up wraps on this easy technique. Instead of working the width of the ruffle, this method works lengthwise, and you simply work the ruffle as long as desired. Row 2: P6 and turn, k6. Row 5: K6 and turn, p6. Repeat these 6 rows for your desired length. You can add a lot of variety to this technique by making multiple welted ruffles in varying stitch counts, and then sew them together as shown in these examples below. Variation of short-row welted ruffle. Hopefully this gives you a little taste of the multitude of looks that you can create by playing around with some basic ruffles. 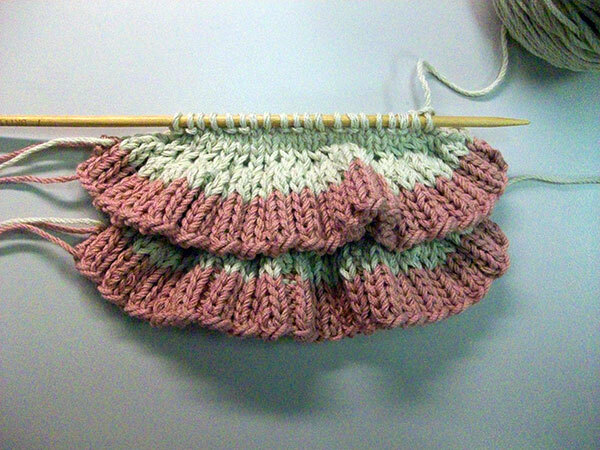 Don’t be afraid to pick up those needles and start swatching!